Tired of reinventing the wheel by implementing drivers for firmware again and again? 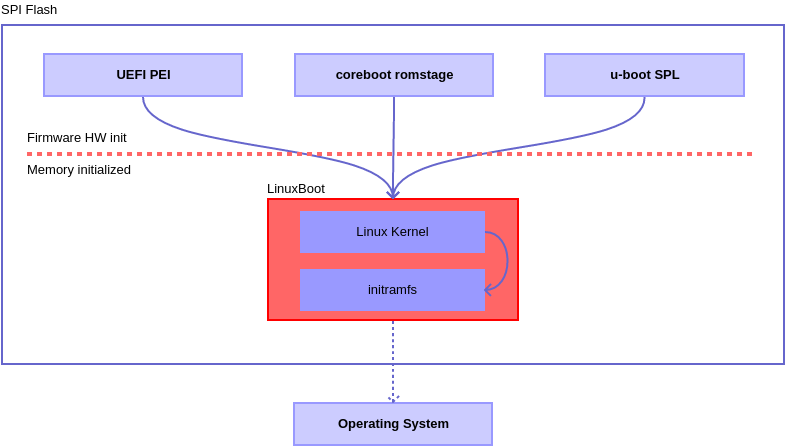 LinuxBoot is a firmware for modern servers that replaces specific firmware functionality like the UEFI DXE phase with a Linux kernel and runtime. Improves boot reliability by replacing lightly-tested firmware drivers with hardened Linux drivers. Improves boot time by removing unnecessary code. Typically makes boot 20 times faster. Allows customization of the initrd runtime to support site-specific needs (both device drivers as well as custom executables). Proven approach for almost 20 years in military, consumer electronics, and supercomputing systems – wherever reliability and performance are paramount. The kernel must be built with CONFIG_EFI_BDS. Follow further instructions on our GitHub. We meet every two weeks to discuss about the latest news, upcoming talks and events, and so on. The meeting is open and everyone is welcome! You can add the calendar below to your own calendar. More detailed instructions and build tools are forthcoming for OCP nodes as well as others.